Gremio Foot-Ball Porto Alegrense, more commonly known as Gremio, are a Brazilian football club based in Rio Grande Do Sul in Porto Alegre which was one of the host cities in the 2014 Fifa World Cup. 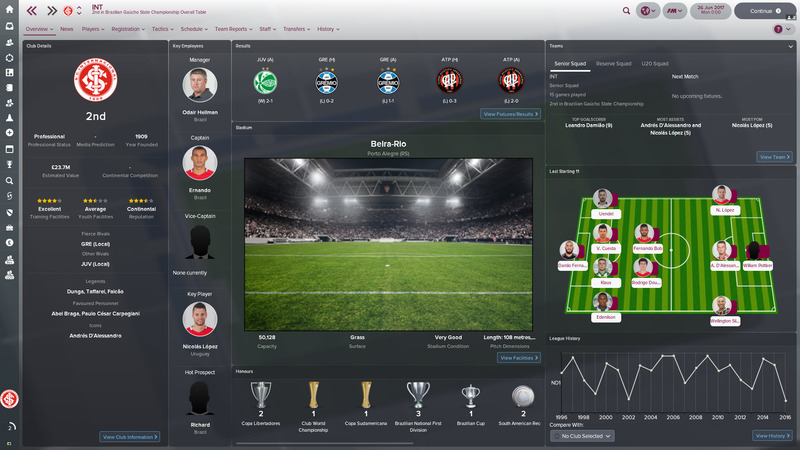 In this Football Manager 2018 post, I review the club and discuss several factors that might influence your save with them! The club was founded in 1903 by Englishman Andrew Fairbank and is actually listed as the third most valuable football club in the Americas. The club badge features three stars (gold, silver and bronze) which represent the victory in the World Club Championship, the three South American competition victories and the success in national competitions. Gremio’s anthem is one of the most critically acclaimed anthems in all of Brazilian football, it is actually the only football anthem composed by a renowned composer Lupicinio Rodrigues. I’d certainly be playing this anthem if ever I win something with Gremio! Gremio play their home games at the Arena de Gremio. It has a capacity of 55,000 and was opened back in 2012. Former notable players include goalkeeper Dida, who made over 200 appearances for AC Milan, former Liverpool left-back Fabio Aurelio, who retired at the club, and also Elano who is mostly known for his time at Manchester City from 2007 – 2009. In my opinion Brazilian midfielder Arthur is definitely the best player in this Gremio squad. Arthur can be used as a defensive or attacking midfielder but I would recommend using him as central midfielder so that he can dictate the tempo of the game, he has a lot of impressive attributes including 16 passing and first touch and also 15 dribbling and work rate. In real life Barcelona actually have an agreement to sign Arthur for €30 Million! The other top player at Gremio is attacking midfielder Luan, who actually has earned himself a full international cap for the Brazilian national team. With some impressive attributes including 16 flair and technique and also 15 dribbling and passing Luan can easily be trained to play either on the left or right wing, however I would definitely recommend that you play him in his natural position of attacking midfield. The one position that I would recommend improving once you take charge at Gremio would be in the striker position, this is because the current striker’s at the squad include Jael and Hernane who are decent but you will need much better if you wish to challenge the other top Brazilian sides for the league title! Luan is clearly the best option but is he more suited to an attacking-midfield role? Our first hot prospect in the Gremio ranks is Matheus Frizzo. This young defensive midfielder has the potential to be one of the starters in your first team by the end of the first season, providing your train and tutor him in the right way. At just 18 Frizzo already has some impressive attributes including 15 passing and decision making which are crucial in a midfield role. Our second hot prospect is a Peruvian youngster who goes by the name of Beto da Silva, he can play anywhere behind the front three either as an attacking midfielder or a winger but I believe he is more suited to playing as an out and out striker. With some decent attributes including 15 dribbling and pace, da Silva has already scored his first senior goal for the Peruvian national team at just 19 years of age. 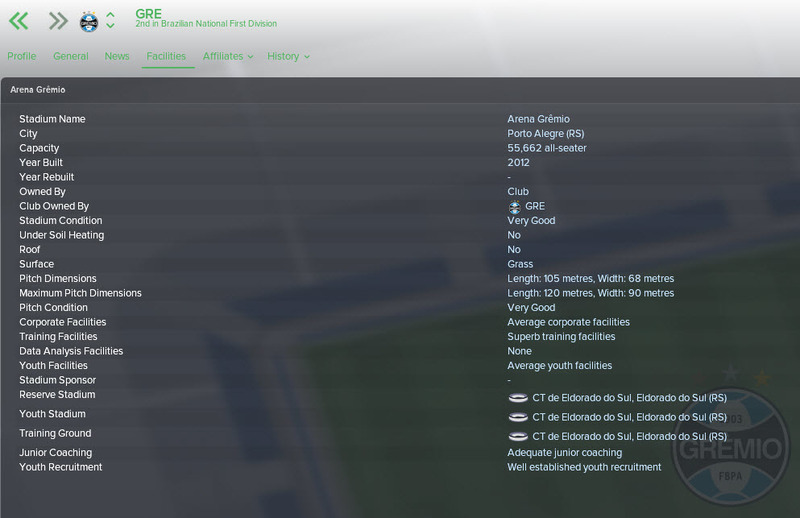 Gremio have okay finances but it will be difficult to bring in some new players without selling some of your stars in the first season with a transfer budget of just £145k and a wage budget of £35k! 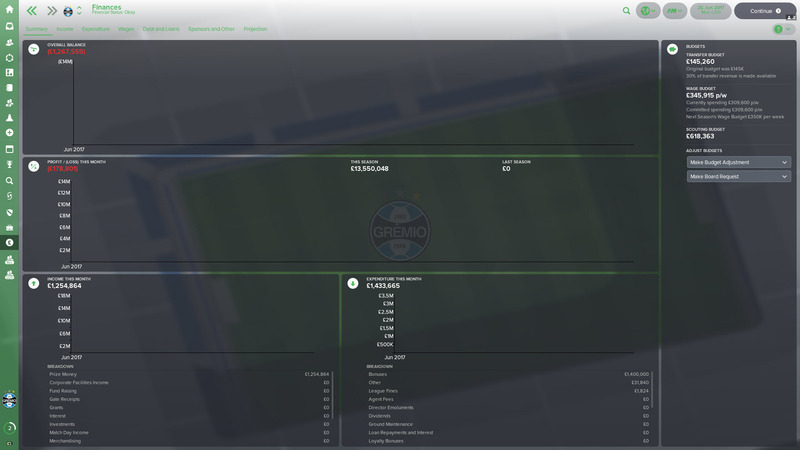 So good luck to everyone who manages Gremio and I hope you have a fun time over in Brazil, please let me know how you get on in your saves either in the comments by heading over to my Twitter @Casual_FM_ thank you for taking the time to read this club guide! This entry was posted in FM Guides | Club Guides, FM18 Guides, Experiments & Wonderkids, Football Manager 2018 and tagged brazil, FM Guides, fm18, football manager, gremio, south america. Bookmark the permalink.